Volunteering on a Nursing project in Mongolia is an exciting experience. As a volunteer you will gain a great deal of valuable work-experience alongside skilled nurses. The facilities are generally of a basic standard and patients will often have travelled vast distances to attend appointments. Nursing projects in Mongolia are based in the capital, Ulaanbaatar. Nurses are usually placed at the large Central hospital, where you will have the chance to work in various departments. Medicine and healthcare practice in Mongolia is typically 'Western', but there are also a number of private complementary medical clinics where you can spend some time, to help broaden your nursing experience. As a nursing volunteer you will have a mainly observational role, shadowing local nurses while they work. The staff are keen for you to achieve as much as possible during your placement, so you will have the opportunity to rotate through a number of different departments. Although in accordance with Mongolian law you will not be able to directly treat patients, you will be able to help take basic observations, help prepare equipment for surgery, transfer patients to surgery, observe surgery, and check patients post surgery. If you are enthusiastic and show your competencies to your fellow nurses, you may well earn yourself a more hands-on role. The supervisors on our nursing placements in Mongolia have a lot of time for keen volunteers. 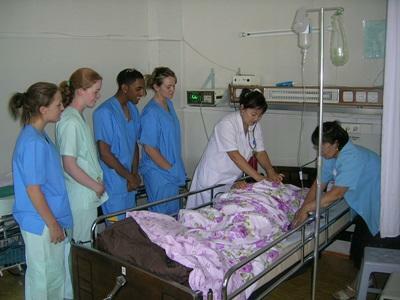 Projects Abroad organises regular medical outreaches for volunteers in order for you to gain a greater understanding of the Mongolian healthcare system. Previous outreach programmes have included basic medical check-ups at a community centre for homeless people, or assisting with a hand hygiene campaign at one of the local hospitals. We also offer monthly workshops for volunteers. These may be lessons about traditional treatments, the history of the Mongolian healthcare system and practical lessons on basic medical procedures - such as how to check blood pressure. While you volunteer on the Nursing project, you will live with a Mongolian host family. They are extremely hospitable and welcoming. You will also meet other Projects Abroad volunteers. There is much to see in the area and a lively bunch of volunteers to experience it with.